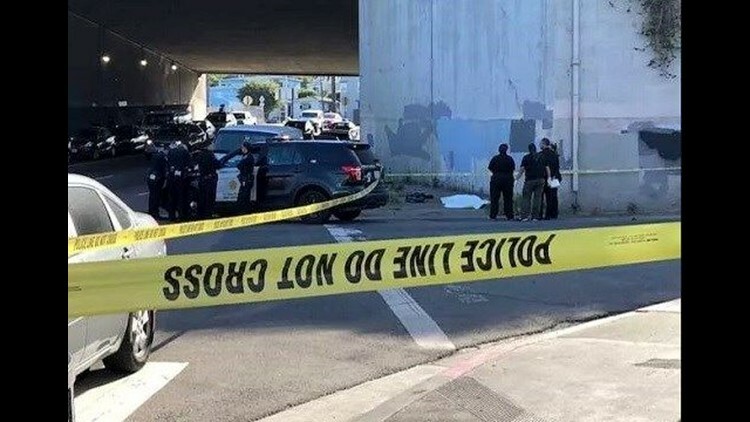 SAN DIEGO (CNS) - Police Monday identified a woman found dead under suspicious circumstances over the weekend in Little Italy, though it's still not known how she sustained her fatal injuries or whether her death was a homicide. A passerby found the body of 67-year-old San Diego resident Victoria Sullenger about 3:40 a.m. Saturday in the area of West Hawthorn and State streets, said San Diego police homicide Lt. Anthony Dupree. Sullenger appeared to have traumatic injuries, but police couldn't determine the cause of those injuries. "Out of an abundance of caution, San Diego police homicide detectives were called to the scene and are currently investigating the incident," Dupree said, adding that detectives hope a report from the San Diego County Medical Examiner's Office will shed more light on Sullenger's death. "It's possible she may have fallen from above, but we just don't know," Dupree said this morning. "Her death has still not been ruled a homicide. It is a suspicious death that's under investigation." If the cause and manner of death is still not conclusive from the medical examiner's report -- which should be completed in the next few days -- police will then seek more answers from the toxicology report, Dupree said. The results of that report typically take several weeks to be completed. Anyone with information regarding Sullenger's death was asked to call the SDPD homicide unit at (619) 531-2293 or San Diego County Crime Stoppers at (888) 580-8477. Anonymous tipsters can also contact the agency at sdcrimestoppers.org.